Lowdown: The tribulations of Israeli army life for a gang of female admin soldiers at a remote army base. As someone who has wasted years of my life serving the Israeli army, I can attest there are three main factors to me considering time spent in conscription duties a waste. First there is the political matter, as in - I do not consider the things I did as a soldier and the things Israel does with its army to improve this world's state of affairs. Second is the fact that, for the vast majority of the time, we are talking about a complete waste of resources; so much more can be done with years of human lives than the Israeli army does. The third is knowing there are so much better things I could have done instead; all I need to do in order to know this is the case is to look at the youth or normal countries where the state does not own the citizen for several years. 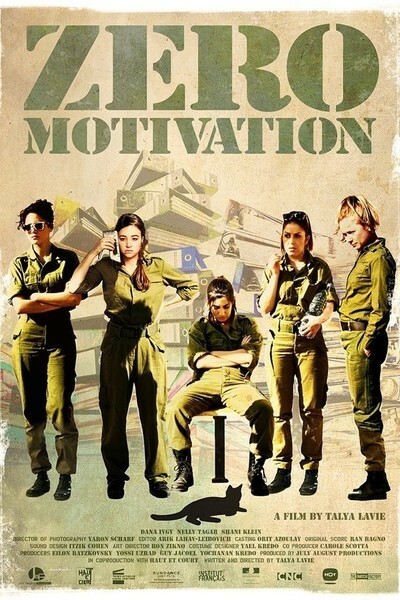 Zero Motivation is an Israeli movie (named אפס ביחסי אנוש, or "zero in human relationships" as per its original Hebrew title) from 2014 that focuses on that second of the three factors. It does so by focusing on probably the least productive sector of the Israeli army, at least in the military sense: the female soldier, generally excluded from combat duties. Well, fact of the matter is that for every combat soldier there are some ten other non combat soldiers supporting them, which means that, female or male, most Israeli soldiers need not bring their brain along to their army service. Our group of admin female soldiers are there primarily to serve the mostly male officers as the latter are busy feeling pompous and important. Core duties revolve around the adequate serving of coffee and biscuits. No wonder Daffi, one of those female soldiers stuck at an army base in the southern (desert) part of Israel is sick of it and spends her time daydreaming about doing time at an army base in the centre of Tel Aviv instead. She will do anything to achieve that, including going through all the effort required into becoming an officer. Opposite Daffi is her best friend Zohar. She will do everything to help her friend, but she will also do a lot to prevent her from going away. Between these two, their colleagues and commanding officers revolves Zero Motivation the movie. Escapades include dealing with virginity and its loss (these are 18 year old girls we are talking about here), boys and such, all in the background of the army. Events are made up of typical Israeli army life, and - as someone who has been there - affairs are very authentic indeed. If you want to feel what typical service in the Israeli army really feels like, go no further. Things go a bit too crazy - ludicrous, even - towards the end of the movie. Mostly, though, the result is fairly loyal to the title. Overall: Many comedies before tried to capture the essence of Israeli army life but, as entertaining as they might have been, failed due to the laugh factor. Zero Motivation may be faulty as a movie, but it does capture the feeling and thus deserves 3 out of 5 demotivated crabs.